Will Steve wear a black poloneck sweater at the tablet launch? That is the real question! Is there an Apple games console on the cards? According to a new poll, 1 in 3 Brits believes that there is. And 50 per cent of us would buy it. The poll was carried out by retail website MyVoucherCodes.co.uk who polled more than 2,000 people, and now reports that 1 in 3 believe an Apple videogame console is already in development and that half of those polled would buy it if there was. The poll results also showed that Steve Jobs is "the most respected entrepreneur" ahead of Richard Branson and Bill Gates. In other interesting statistics news, 2 in 5 preferred Apple to Microsoft products, 81 per cent believe that Microsoft's Xbox 360 would be worst hit if Apple did launch a console and a mere 16 per cent said they would "definitely not buy an Apple videogames console if one was developed." Mark Pearson, founder of MyVoucherCodes.co.uk said: "It's fair to say that Apple's popularity is at an absolute peak, and I can't see wunderkind Steve Jobs and the board allowing the momentum to slow down. "The launch today of their iSlate, if that is the name the company decide to release their iTablet under, coincides with huge consumer support for Apple. 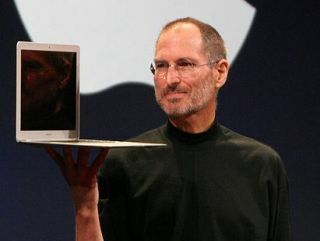 Steve Jobs, despite not being the richest entrepreneur on the block is revered by the majority, making his brand very dangerous in the open market. "If Apple were to release a videogames console as there seems to be demand for, it would be the Kryptonite to Microsoft's Xbox 360's Superman - consumers will always play the two off against each other. "I believe Jobs' Apple would dominate videogaming in the way iPod has become synonymous with MP3 players, and iPhones have led the charge for the title of 'must-have' mobile phone. We see it online at MyVoucherCodes – Apple products remain the leaders in their field in terms of search and sales statistics."